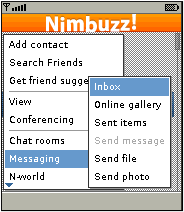 Nimbuzz released version 1.98.1 of their chat and instant messaging app recently. Based on the minor change in the version number this is probably just a minor bug fix update. Nimbuzz didn’t bother to issue release notes or do a blog post about this release. Installing 1.98.1 will stop Nimbuzz from nagging about a new version being available, but I didn’t notice any changes from 1.98. Nimbuzz is a multi-platform IM and Chat app that lets you connect with your friends using Facebook Chat, Yahoo IM , Google Talk and Nimbuzz Chat. The app “Nimbuzz” (620 KB) is ready to download or send to your phone as filename: “nb1981t”. Hey! Why do not work ? Probable reasons are that you don’t have paid data for downloading or your phone doesn’t support Java ME apps. I CANT DOWNLOAD CAUSE OF ITS MANY ETC…. It won’t. Only games from the Windows Phone Store work on Windows Phone. Not possible. Apps ARE data. hey please me how to download app. what game that chat 11 years old? There are more Gtalk apps here: http://boostapps.com/tag/gtalk maybe one of them will work. There’s no way to increase your phones memory. As I told you before keep trying Facebook Chat apps until you find one that works. Ones that use less resorces includin older versions of the Facebook app, 2Go, Mig33 and WeBuzz. I just tested downloading Nimbuzz 1.98.1 to my LG Rumor Reflex it worked the 1st time. Downloads stopping partway through are usually caused by a network error. Retry somewhere that you have a better signal. Halo is a commercial game so if it’s free its warez and I don’t do warez.